No, i dont require a navigation system, the original cd radio player is good. yes, parts are easily available.. But if god forbid u need a radiator, then I have heard that it can be a problem. Oh okay one thing more did toyota company take daihatsu move for maintainance? Yes the did. But when the connected the OBD scanner ( the computer thingy) to the car that didn't work. Otherwise they checked everything thoroughly and tuned it. My dear, what is fuel ave. Mine gives 16 km per litre bought in Oct 2013 , it is from year 2010. You ve taken SUCH a wise decision of buying a JDM car for 7.5 lakh! most people in Pakistan would have saved a few thousand pkr and would have bought a pepsi tin can with wheels under it, sometimes known as suzuki mehran. but not u! i mean just look at the features this car has, not even the new city has features like that which costs more then double that amount! 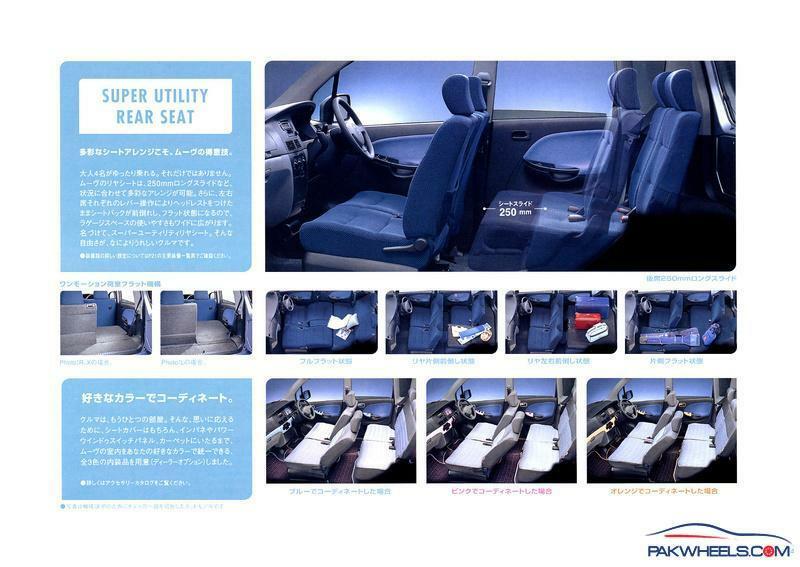 n i was blown away when i saw the rear leg room where the heck do these Japanese squeeze out soo much space from a small car like this one! as for rims, i would suggest u go for atleast 14 inch size and 175 tread size. due to the shape of the car (too high and not wide enough) stability is an issue and its a genuine issue! one that needs ur immediate attention. getting larger and wider rims n tires would enhance the stability and braking. n u ll enjoy the drive even more. so unless u know a good dealer, i would still suggest that the tin box is the best option. i just discovered recently that it has reclining rear seats, now thats something u get in big luxury german sedans...what an experience! yes, thats what i am going to do. thanks for the suggestion. Dear Brother i have also puchased Daihatsu move 2008 model and i am fully satisfied with it. Previously i owned Suzuki Mehran VXR with cng. You cannot compare both cars there is a lot of difference. Move is very comfortable and capacious car. seats are very easy and adjustable. Sir i partly agree with u. even a rusty old messed up JDM import vitz would be better then a brand new mehran. atleast those cars are structurally sound n well built. they wont crumple like a tin can in case of an accident neither would they start to fall apart within one year of acquisition. i have seen mehran/alto engines dying at less then 50k kms. the issue is with the build quality of local suzukis. theres no such thing as quality control or safety features. Most dealers are not honest but the most they do is paint a few panels, reverse the meter or at max, repair a small chassis damage. even that doesnt really hurt the car's overall experience. JDM cars all the way!!! Alot depends on the driving style, traffic conditions, car maintainance and Power to weight ratio... Also the mileage is better in a 5 Speed CVT transmission as oppose to Normal 4Speed Auto gear. Nice Ride ALLAH buri nazr se bachaey..
i am having daihatsu mira 2007 having same engine i am also interested in tuning up my car can you suggest me where should i go?? and wanna change its plugs. so suggest me about that. i was going through a thread about a similar car when i found an interesting illustration of folding the front seats and recling the rear seats to make a whole bed. i then did it myself and it took less than a minute.